Successfully Added 10pcs+ Breathalyzer Alcohol Tester Keychain + Flashlight to your Shopping Cart. 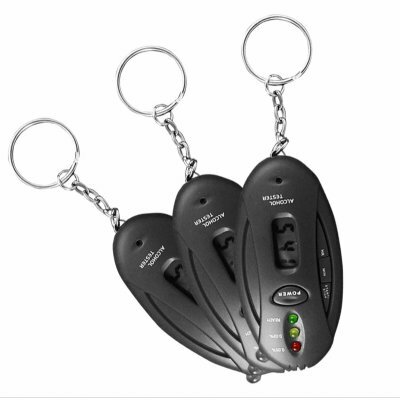 10+ quantity breathalyzer alcohol tester keychains with flashlight. Super low priced Breathalyzer BAC Level Tester with a built in flashlight and with additional countdown functions. This is a handy little gadget to have with you when you are going out for a night on the town. Just attach it to your keychain, and when you want to know if you have had too much, simply blow on the Alcohol tester. Readings are easy for anybody to read as green is safe, yellow is caution, and red means danger. We now offer this item as a discount quantity of at least 10 pieces in order to give you the absolute best resale profit margin from our low sale price and even better shipping rates. Brought to you by the leader in wholesale direct from China Electronics, Chinavasion. Note: The result of this test gives BAC for reference only and cannot be used as a legal defense.